Add your accounts without restrictions. In the app you can create one account or as many as you need. These can be, for example: cash, abc bank, credit, savings on travel, spending on holidays. 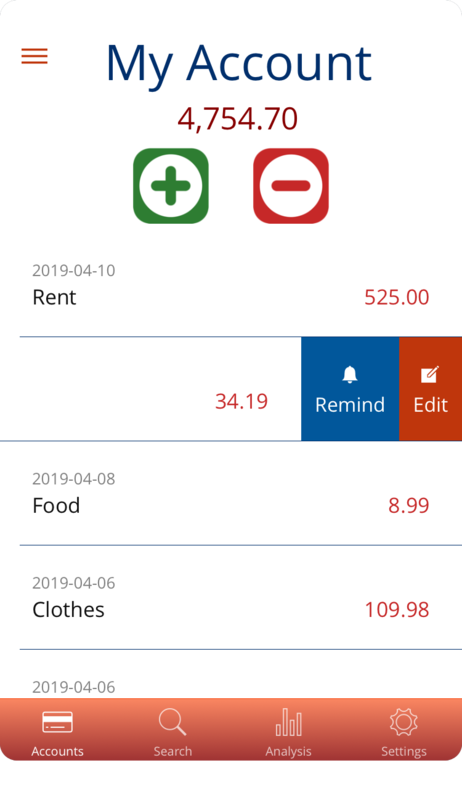 Add your income and expenses to your account just by tapping the plus and minus buttons, respectively. 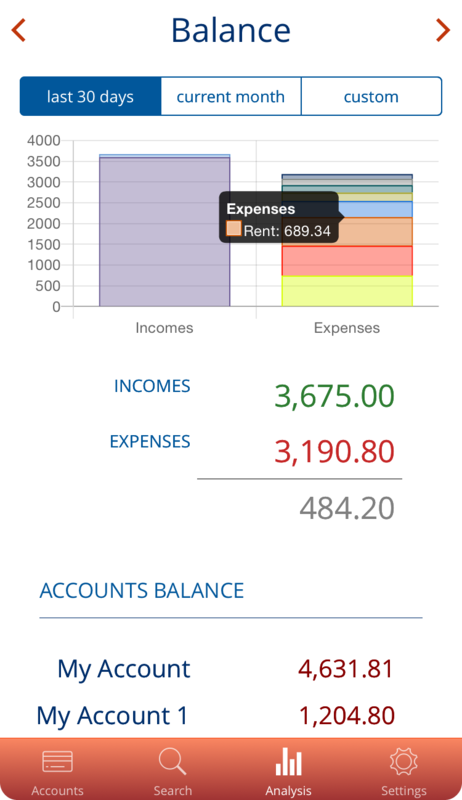 To add an income or expense, just tap the category, enter the value and it is ready. Optionally, you can also add a transaction description and a note. In Settings you can optimize this screen. 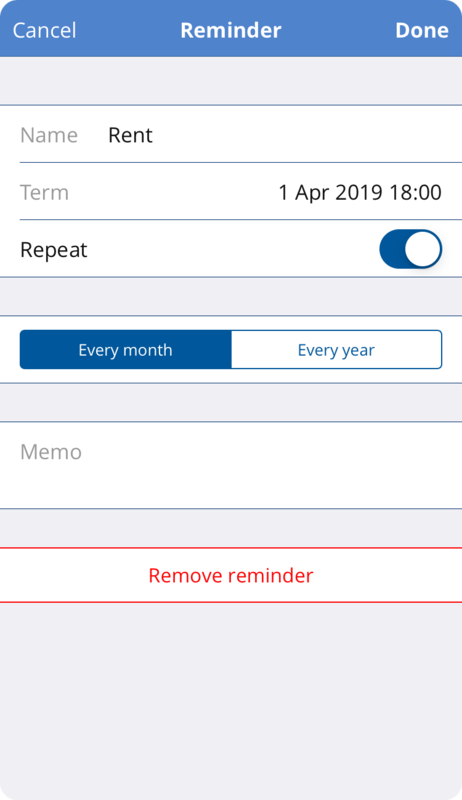 The app may suggest the most-selected categories and the date of the transactions as separate buttons. From the list of recent transactions, you can delete or change any transaction by swiping it to the right or to the left. This way you can set a reminder, as well. Swipe left on the transaction to add a new reminder. Then set the reminder and forget that you must remember. The application will remind you. By entering a phrase in the search field, the app will search for all transactions that match the phrase you entered. You can search by account names, categories, transaction descriptions and notes. You may also limit results to a period in time. 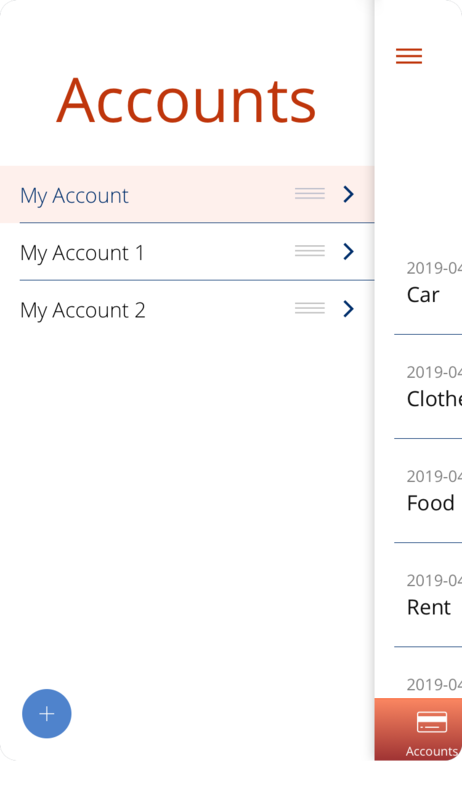 My treasury provides several types of analysis of your income and expenses, providing you with full control over your finances. It's a summary of incomes and expenses in all accounts by months and years. You can view all or any of your accounts this way. Just use the filter option in the upper right corner. 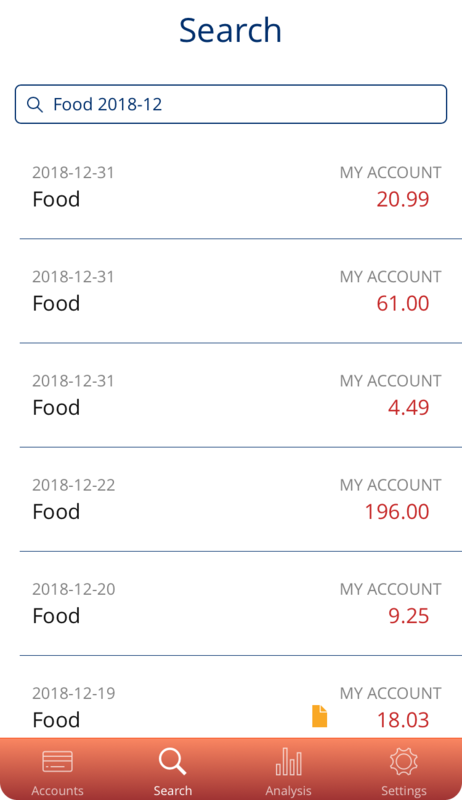 From here, the app allows you to go to the balance of a single month. 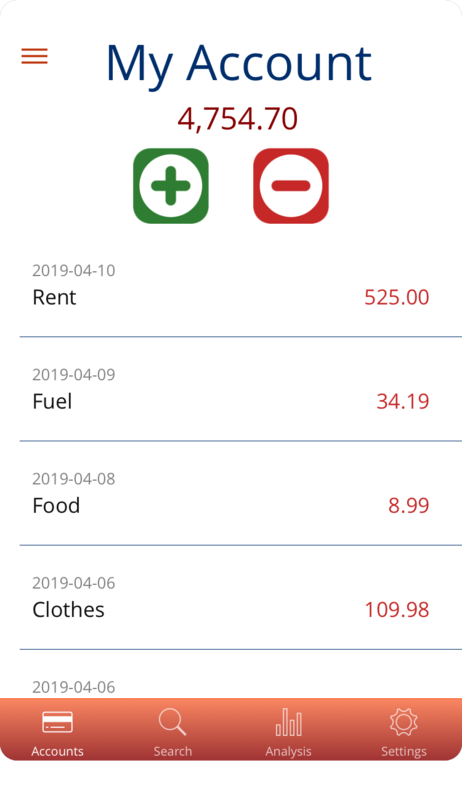 With month balance you can check the result of your income and expenses in a given month. 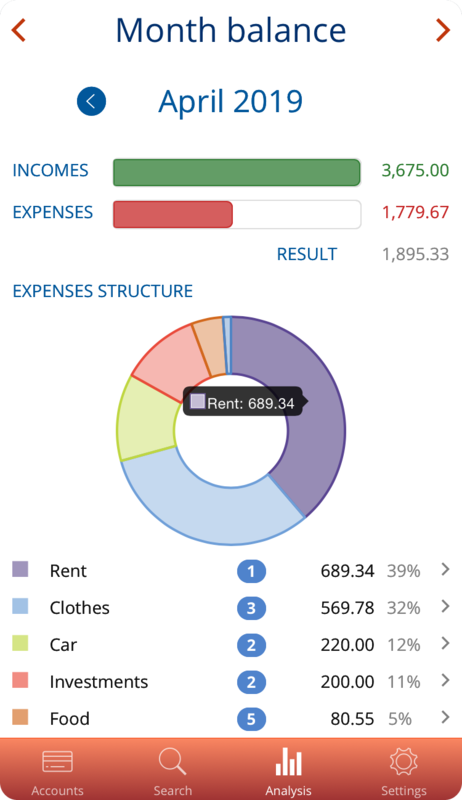 The structure of your expenses tells you what do you spend the most at. 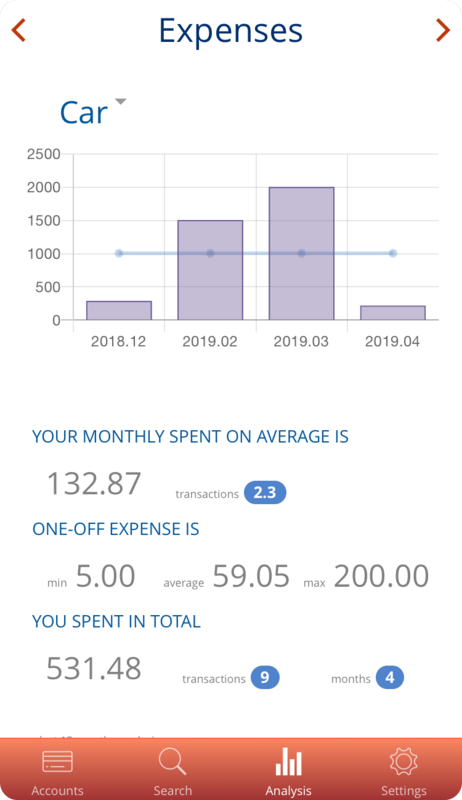 There is also a link to further analyze the history of expenses within a category. 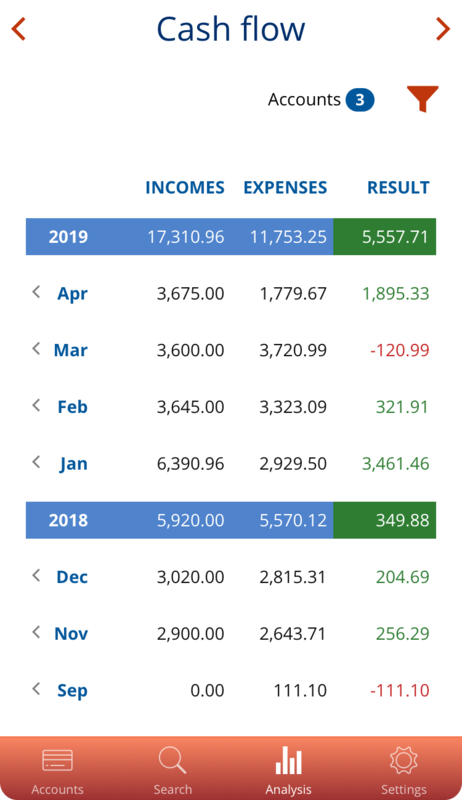 This analysis allows a detailed preview of how your expenses change over time for a chosen category. Additionally, you receive the average number of transactions, the maximum, minimum and average expense as well as the total expense in a given category. 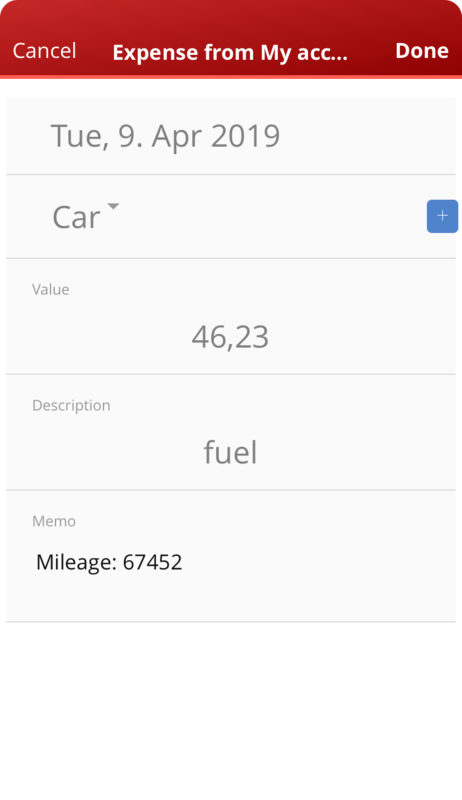 Also can be useful for a separate analysis of expenses on eg. a trip, after creating a dedicated category. 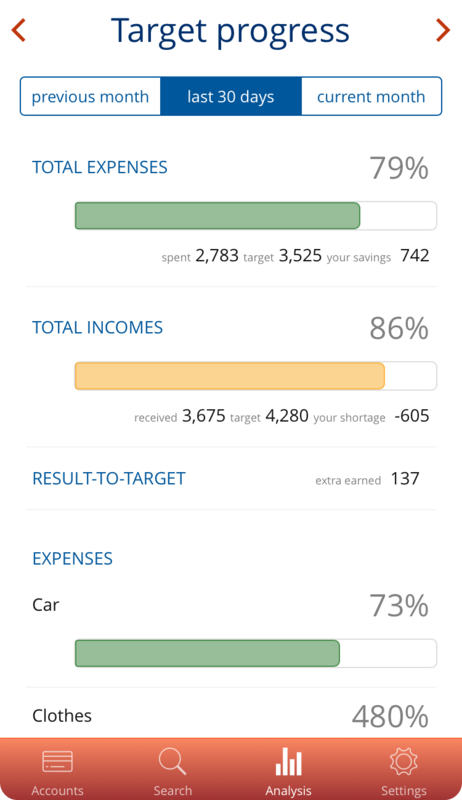 Here you can verify on an ongoing basis whether your expenses exceed the defined goals. You can see total results as well as progress within each of your categories. 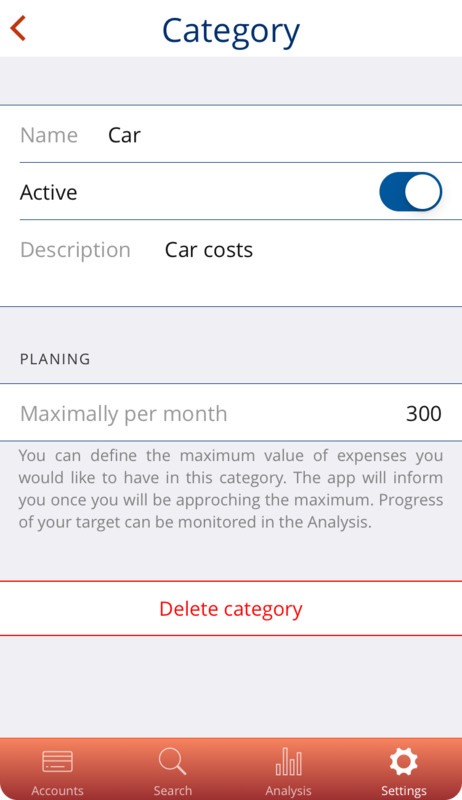 You can set a planned value of expenses for a given category. The app will inform you when approaching a given limit. This value is used as a target to watch in analysis. 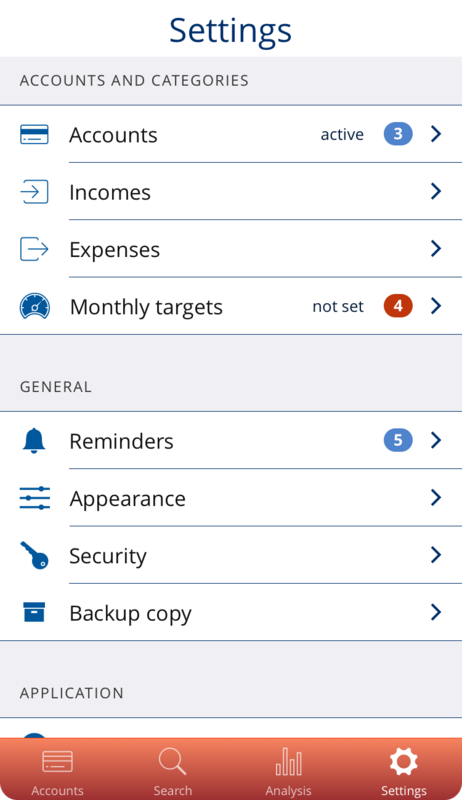 Among many other things, in Settings you can define your accounts, income and expense categories. Here, in Appearance, you will find options, which can shorten the addition of a new transaction to a few tappings. 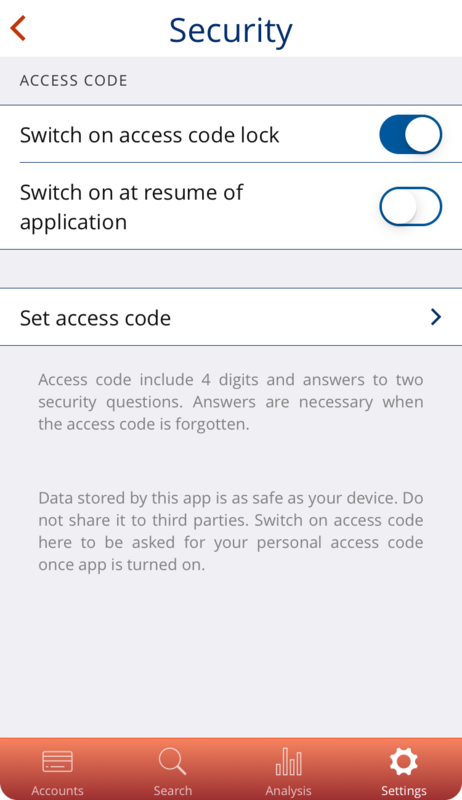 In Settings, you can enter the application access code. This is especially useful if other people use your phone. The backup allows you to save all transactions to one file, which you can then place to any other location, e.g. in the cloud. Data in the backup can be read only by the app. 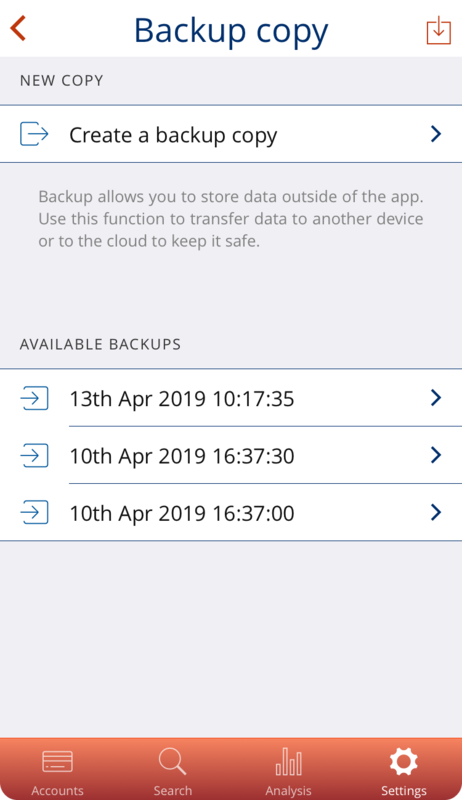 With the backup you can continue to use the app even after a change or breakdown of your device.